'At least someone made the right call,' the quarterback says. It appears the no-call during the NFC Championship Game that may have kept the New Orleans Saints out of Super Bowl LIII has been on Drew Brees’ mind. In a new national broadcast ad for Untuckit from creative agency Amalgam and directed by Native Content’s Shaun Collins, the Saints quarterback jumps at the opportunity to opine about what he sees as an officiating error. 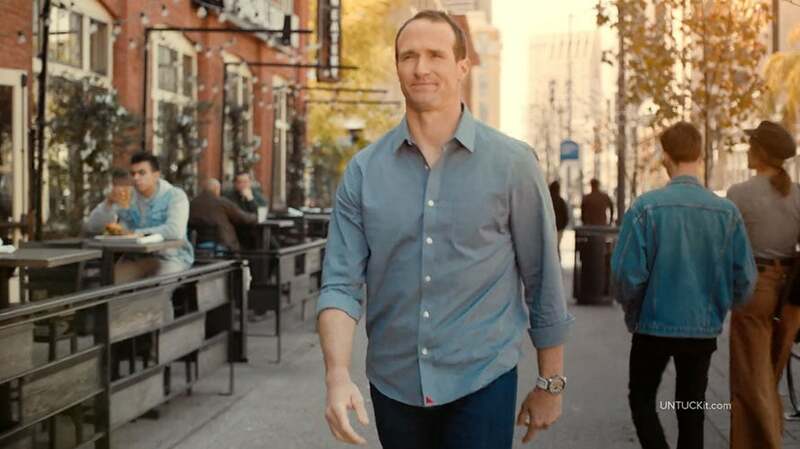 “The Right Call” contrasts Untuckit shirts’ with regular button-downs, which look sloppy when not tucked in, eventually arriving at its punchline: Brees remarking, “At least someone made the right call,” as a man passes by wearing an Untuckit shirt. The ad makes its broadcast debut today and will run on networks including ESPN, FS1, CNN, Bravo, HGTV, TBS, TNT, E! and USA. “Sports and athletes have always been a powerful platform for us,” he added, explaining the relationship with Brees is long term. Wayne Gretzky and Nascar driver Chase Elliot are also investors in the company, and Arizona Cardinals running back David Johnson is “also a great partner,” according to Riccobono. “We’ve strategically increased marketing and advertising across sports television, radio and arenas across the country, and just last week, we launched a product collaboration with Major League Baseball,” he added.